About diamonds — Harold Weinstein Ltd.
Diamonds are the hardest of all natural substances. They have been cherished for millennia by royalty as the ultimate symbol of power and wealth. People of ancient India found diamonds on the ground after monsoon storms and thought that they were solidified lightning. In 1477 Maximillian of Austria asked his court astrologer for the stars' suggestion for that "just right" token to bestow on Mary of Burgundy to mark their engagement. You guessed it...the stars suggested a ring with a diamond. And as DeBeers says: boy, did Max and Mary ever start something! Why a ring? A ring is round, without corner or end, and as such has represented eternity throughout history. The Romans believed that third finger of the hand (left or right, it doesn't matter) was connected to the heart by a vein of love. That finger was reserved for wedding (and engagement) rings. Rings of power (like those worn by the Pope, bishops, royalty) are worn on the index finger. 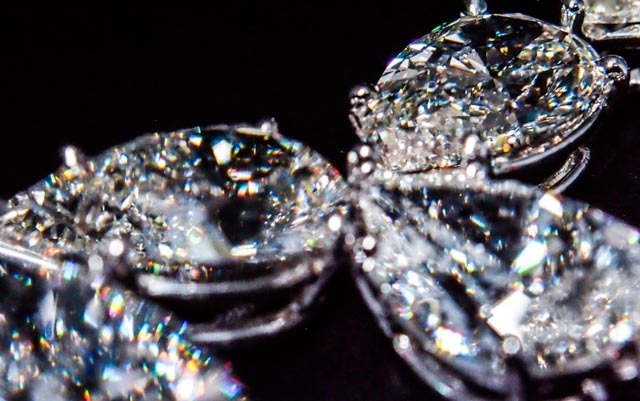 Diamond dealers have always known what a good diamond looked like, but until fairly recently, there was no way of actually describing diamond quality in terms all could understand. The first aspect of diamond quality to be "graded" in any serious way was colour. Wonderful but arcane terms were used like river meaning top colour, Wesselton meaning mid-range colour, and cape meaning deep colour. Today diamond people still call strongly yellow-coloured stones: cape. In the mid 1950's the Gemological Institute of America developed the scale that is used pretty much world-wide today. The scales were broken into two categories: colour and clarity, because each is a separate element. One has nothing to do with the other. The clarity of a diamond refers to the number of inclusions (internal marks) and blemishes (external marks) the diamond may have. For the most part, the clarity of a diamond is determined by how visible those marks may be. Clarity is graded on a scale which ranges from Fl (flawless) to I-3 (very obvious and potentially damaging marks). The GIA colour scale replaced terms like "river" and "cape" with letter grades from D (a total absence of colour) to Z (very deeply coloured). The quality of a diamond has three components. Clarity and colour are important but the third element, cut, determines how beautiful the finished diamond will be. Nature is responsible for marks and colour, but the diamond cutter is the one who unlocks the true beauty of a diamond. There is no way, in the course of a few pages on the net to give you a sense of what a really fine cut means...but if you look at a group of diamonds it is possible that one may stand out from the others. It may have more fire, more sparkle, more life. That is what good cutting is all about. All the light that passes into the diamond is reflected back to your eye. The stone is lively and dancing with spectral colour. There are specific measurements that a cutter follows to yield the finest cut diamond (our logo is all about measuring those) but your eye tells you more than numbers on a sheet of paper. Remember, fine colour and fine clarity are all well and good, but without really good cutting your diamond is not going to be as beautiful as it can be. Also remember, really good cutting is not cheap...but it is worth every extra dollar. Which Diamond Should I Buy? We are often asked what is the best diamond, which one should I buy? The answer is always the same. Buy the biggest, best looking diamond that you can afford. If you have unlimited resources, then the finest of all three elements (colour, clarity, cut) is the best diamond for you. But if your funds are limited then the best looking diamond is frequently that diamond with the highest (least) colour and the best cutting. Unless the marks in a diamond are either eye-visible or potentially damaging, who cares! People get all hung up on VVS and VS grading...neither of which the naked eye can detect (if you can see the marks, it "ain't" VS, or SI for that matter). If the diamond is an engagement stone, chances are you will not be buying it in order to resell it. That being the case, cutting and colour are the most important elements in determining how beautiful the diamond can be. If your funds are very modest, go for finest cutting every time! Learn about the 4 C's of diamond quality.